It really hit me at this show. This would be the last time I'd hear a show start with "You Wanted The Best, You Got The Best....". And when I heard it, I got choked up. The last time I'll see 'The Move' during "Deuce", and when it happened, I was choked up. 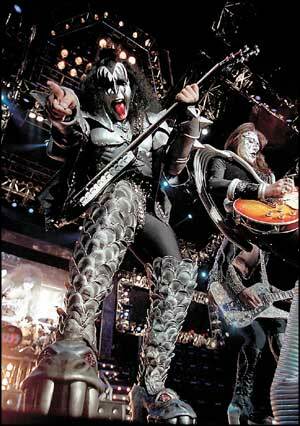 The last time for Ace Frehley's little backward stutter step in "Shock Me." The last crotch thrusting, fire breathing, blood spitting, tongue wagging, flying performance by that 50 year old package of demonic insanity known as Gene Simmons. The last stellar performance by rock's ultimate front man, Paul Stanley. The last live performance of "Beth" by Peter Criss (well, I don't really mind never hearing that again). No more "Detroit Rock City". No more "God of Thunder". No more pyro, confetti, fire, bombs, volume and carnage known as KISS. This would be the last time I would hear Ace's cheesy joke after his smoking guitar solo - "Something strange going on here. That guitar is only three years old. It shouldn't be smoking!" During his intro to "2,000 Man" he mumbled something like "How about something off of 'Dynasty'?" and the crowd gave absolutely no response. He retorted with "I thought that was a hit album" and started playing "2,000 Man". Ace must have realized this was such a special show for me, because he even took the time to know where he was, unlike earlier this summer. He also gave the bunny ears treatment to Gene during the final bows. It can be so refreshing to see someone who still gets such a kick out of the same stunts he pulled when he was in grade school. I didn't think it could happen, but KISS really is going out on top. Their playing has been the best it's ever been. Ace and Peter have been very sharp and into the shows each of the three times I caught this farewell tour. The set list has been great and the energy has been there for the whole show. The clips from throughout Kisstory that were shown on the screens during "Do You Love Me" even had me on the verge of tears. I'm glad to be such a sucker for KISS shtick. And there is still no better rock show finale than "Rock and Roll All Nite".